Art and Philosophy in the Classroom is an ongoing collaborative project that I have been testing and developing since September 2013 with Dr Aislinn O’Donnell (Lecturer, Philosophy of Education, Mary Immaculate College, University of Limerick). It is an interdisciplinary pedagogical approach to contemporary visual art, which combines philosophy with children and arts and gallery education practices. The project began with a conversation I had with Lynn McGrane (Freelance Education Curator) and Liz Coman (Assistant Arts Officer, Dublin City Council) around an exhibition they were curating for The LAB in 2013 called NINE. The exhibition invited five contemporary visual artists to reflect on what it is to be a child in Ireland in the 21st Century. We began to discuss how children and young people often have little or no engagement with contemporary practice throughout their formal education and how we might initiate a public discussion around this issue. I approached Aislinn, as I had seen her speak at the Lighting a Fire conference in April 2013 and had found her responses to the arts in education charter very thought provoking (a link to her paper can be found here). Initially I approached Aislinn to chair a discussion, but her first response was to bring children into the conversation and to discuss with them their views on contemporary art and visual art education. Image shown: Visit to EVA International Exhibition. Photograph Deirdre A Power. From there we developed a three-week project with an inner city school in Dublin 1, which culminated in a public discussion that involved the children and their parents, as well as artists, teachers and those in arts / arts education (see link below for the video). Since this initial pilot, we have had two one-off sessions with the Mobile Art School (2014), an 8-week project for Young EVA in response to the EVA international exhibition 2014, and a CPD session for teachers and artists at The Ark in collaboration with DCC Arts Office in November 2014. Our aim is to develop and evaluate an interdisciplinary methodology that introduces contemporary art and philosophy to children that foregrounds the voice of the child. To date, we have tested ways to reflect on art and children’s unique views on the world through philosophical discussion, collective and individual inquiry, drawing, writing, contemplation, group exercises, working with artists (including to date Rhona Byrne via the Mobile Art School, Garrett Phelan and Blindboy Boatclub from the Rubber Bandits), looking at reproductions, and visits to exhibitions. Contemporary artists reflect, critique, and question the world around them, while philosophy asks questions about our knowledge, reality and existence - so coupling the two seems an obvious and relevant crossover. 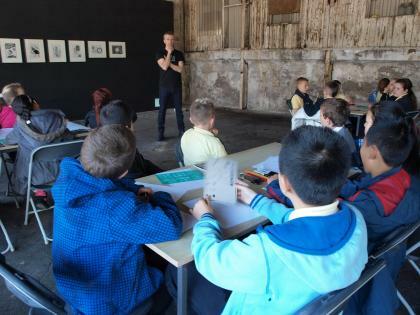 Image shown: Young EVA workshop with artist Garrett Phelan in Cleeves Factory, EVA International 2014. Photograph Katy Fitzpatrick. What never fails to surprise me are the genuine responses that the children have when they realise that their voice is being valued and that there is no right or wrong answer, their capacity to engage for extended periods of time, and their capacity for deep thinking and critical reflection. Each session we learn from them and it helps us to develop and change the way we approach our questions and methodologies. Some ongoing challenges include how to represent this work beyond the classroom and keep the voice of the child at the centre of it, and what kinds of evaluative methodologies are appropriate, as we don’t want to predefine outcomes or indeed lose the open-ended nature of the work. To realise the full potential of the project and to have a legacy beyond a number of weeks we are keen to explore working more collaboratively with teachers to develop and integrate these child-centred methodologies. Image shown: Feedback from pupils on the Young EVA project. Photograph Deirdre A Power. The ongoing development of this work would not be possible without the support of institutions; Dublin City Council’s Arts Office and EVA International have been instrumental in this regard. Both have supported longer-term projects which allow us to bed down and really reflect on what we are doing, to develop our methodology with children, and to consider how we can evaluate this type of work. 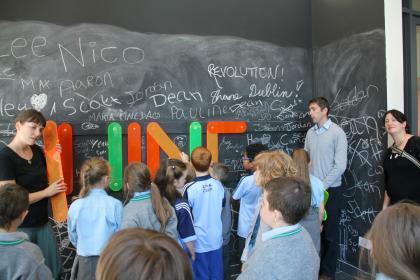 We are looking forward to working again with Dublin City Council’s Arts Office this spring/summer with two projects. The first is a series of one-off sessions as part of a larger Dublin Docklands project with artists Martina Galvin and Cliona Harmey (relating to Cliona’s public artwork Dublin Ships, which is currently on display in the Docklands). The second is two three-week projects in primary schools in the north inner city (and close to The LAB) to develop the project, build relationships with the schools and The LAB, and in particular to work more collaboratively with the teachers. Aislinn and I are also engaging in an ongoing conversation with visual artist and curator Jennie Guy to see where our overlapping practices meet and how this might manifest in future projects or publications. Image shown: Zine made by pupils in collaboration with Garrett Phelan, Young EVA 2014. Photograph Deirdre A Power.